and how many different types of thread you keep at hand. Reasons for organizing embroidery floss? 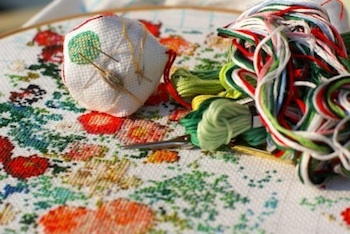 When you are ready to begin a new needlework project the first step may be to find, or buy, the threads you need. If you are not organized it can often take longer to search through your stash, than it would to go and buy new skeins. Don't you also find that new skeins have much more appeal than the tangled remnants at the bottom of the box? I felt that getting organized would also prevent me from buying duplicate skeins. In fact, when I started to sort out my colors I found I had 8 skeins of electric blue! Do you only work at home or do you carry your work around with you? Do you want your collection on show, or tidied away out of sight? Do you want to keep everything for a project separate from your main collection? How much room do you have to store your threads? How easy will be it to find a particular color or type of thread? Are all your threads packaged in the same manner; skeins or balls for example? Organizing embroidery floss by number or colour? You have choices to make here. If you are a cross stitcher you may prefer to store your threads in manufacturers number order. For freestyle work you might keep similar colors together, irrespective of the number. 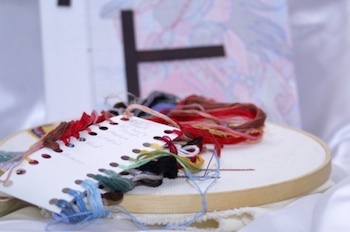 If you do hardanger embroidery it might make more sense to sort them by thickness instead. So what products are available to you? 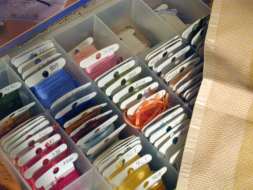 Do you have to make a big investment when organizing embroidery floss and other threads? Luckily, there are some cheap ways to do this, especially if you don't mind a bit of DIY. Let's look at some of the options. My local needlework shop stores their floss in wall units with transparent fronted drawers. Although this might not be possible at home, a quick trip to your local DIY store may find something similar. You are sure to find units designed for storing nails and screws which would work a treat! My tip is to take some skeins with you so that you can try the units for size. The drawers need to be deep enough, front to back, for the skein to fit comfortably. Cardboard dividers will keep different colors in each drawer separate. Neat labels on the drawers, giving the colour numbers, make the threads easy to find. The drawbacks arise if you do not have the whole collection of threads when you set up your system. Do you miss out the colour numbers that you do not have? Or do you have to reorganize the drawers later when you increase your stock? Many people like to use a system of wrapping their floss onto numbered Plastic Floss Bobbins which are then stored in boxes with dividers inside. You can also get cardboard bobbins, on which you can write the thread number. But these do tend to get worn and scruffy after a time, and then need replacing. The Organizer Boxes are transparent allowing you to see the colour range without opening the box. It is simple enough to add new threads to your collection. Just slot them in where they belong. When you remove a bobbin for a project, pop a placeholder card in its place. You can then jot down the name of the project, if you have more than one on the go at a time. The Loran Cross Stitch Project Cards - are one of my favourite systems for getting organized. Rectangles of stiff card have evenly-spaced holes punched down the right hand side. Each hole holds a skein of thread. To attach the floss, first cut the skein into your ideal stitching length. Then fold the bundle in half and push the folded end through the hole, forming a loop. Pass the cut ends through the loop and pull firmly. Write the colour number beside each hole as you go along, including all the colors in the range. You can add any that you are missing, later. The left hand side of the cards have smaller holes so that you can place them in the binder. Remove the amount of floss needed for your project and attach to a smaller card. This leaves the bulk of the thread in the original binder. It is simple to remove just one length, for use, with the eye of your needle. Return any unused thread to the binder at the end of a project. Another method of organizing embroidery floss is to use small plastic ziploc bags. Each bag holds one colour. Full skeins and leftover strands can be stored in the same bag. You can store the bags in boxes or baskets in either number or colour order. My friend Angie keeps all her blues in one basket and the greens in another for example. The bag idea works well for project storage, also. Just thread the required bags onto the ring to carry around with you. Write the numbers on the bags with a permanent marker and you're set to go. You might also want to consider the StitchBow Floss Holder for storing and organizing your threads. I hope this introduction has given you some ideas for organizing embroidery floss. Now are you ready to start organizing the rest of your stash?